Global Reservation & Revenue Management System for Restaurants. 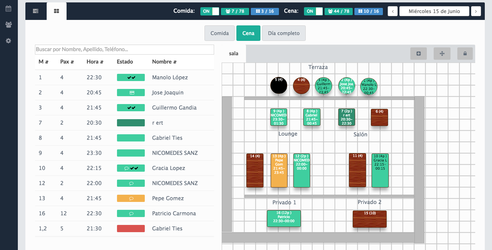 CoverManager is the tool specially designed to change the way in which restaurants create, sell and manage their reservations. We help to improve the occupation of the restaurant and eliminate no shows, our main goal is to grow together. Your guests can book a table any time of day 7 days a week, and will receive an email and sms confirmation. CoverManager is the only service that supports 3 types of reserves to help increase demand and reduce cancellations and no shows. Guests can book a table completely free. Prepay partially or total ticket, which is then deducted from the final ticket. Useful for group bookings, and for eliminate short notice cancellations and no shows. In case of no show or cancellation of the reservation at short notice, a charge per guest will be made. Assuring those incomes your are now lossing in high occupation days for these reasons. We reconfirm your restaurant reservations every day, helping with the cost of reserve management and allowing the restaurant to fill the table with new customers in case of cancellation at short notice. Revenue Manager for Restaurants. Automatic emails and sms confirmation, modification and cancellation of reservations. You can send emails and sms customized to each client for loyalty. Automatically sending private quality surveys that allows you to analyze the opinions and intervene to improve and increase customer loyalty.